I know, I know. It's been a little while. But, as is often the excuse for inconsistent blogging, I've been busy. Namely, work has been increasingly busy as of late, and in my off time I'm working on putting together another show for Robot Vs. Dinosaur (auditions are today, if anyone is interested; visit our blog for details. I would have posted that earlier but, again, snowed under). And on the weekends, I've been going to weddings. This last weekend, I had two in one day: my former college roommate Eric and his new wife Kathy, and my friend and former fellow Purple Rose Apprentice Jesse and his new wife Sian. Eric and Kathy's wedding was at 1:30 and Jesse and Sian's wedding was at 2:30, and both were in different parts of Southeastern Michigan. Needless to say, there was a lot of driving over the weekend. 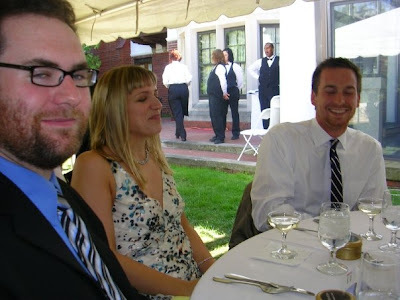 I'm on the left, my girlfriend Katie is next to me, and that's another former roommate Andy (who is reading this blog right now) on the right. For those of you who are witty, write a caption and leave it in the comment box. Who knows, if I continue to get swamped it might just make a post. After we left Eric and Kathy's wedding, which was at the Cranbrook House gardens in Bloomfield Hills, we drove to Ann Arbor to catch Jesse and Sian's reception. The invitation said the wedding would be in the botanical gardens and that the reception would follow. We assumed from the invitation that the reception would also be at the botanical gardens, but that turned out not to be the case and there was a completely different wedding there once we arrived. We managed to find out from the visitor center that the reception was actually at a local micro brewery and, after searching through the phone book, finding the number, calling the brewery and wrangling the street through poor cellphone reception, we finally made it to the party. I was lucky enough to have the Greatest Major League Baseball Girlfriend Ever accompany me for the weekend, and she remarked on the ride home how strikingly different weddings can be. Both weddings were a perfect reflection of both couples. Where Eric's groomsmen wore tuxes, Jesse's wore tweed vests and hats. Where Eric and Kathy had a champagne toast, Jesse and Sian had us raise beer steins. Eric and Kathy had a string quartet. Jesse and Sian had a bluegrass band. It was interesting having both in the same day because, despite the contrast in style, both were great times and both were very loving environments. So anyway, that's where I've been.